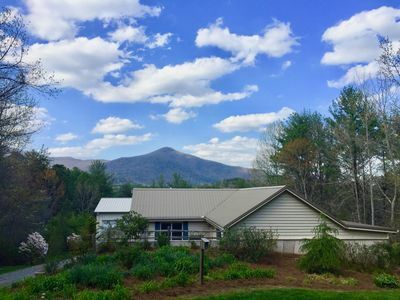 Welcome to Dreamscape near beautiful Helen, GA! 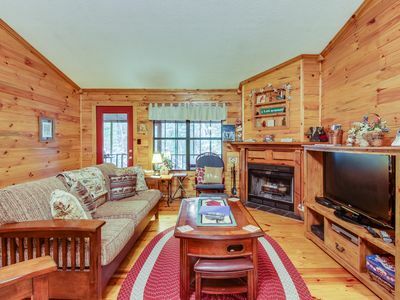 This spacious 2 bedroom, 2 bath Blue Ridge Mountain cabin rental is an absolutely beautiful vacation getaway to enjoy with your family and friends, or just for the two of you! 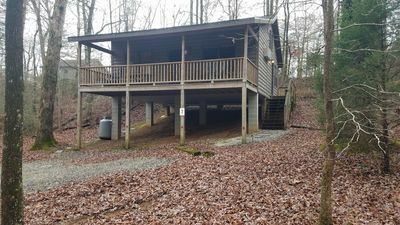 With its super convenient location near downtown Helen Georgia, you’ll have quick access to all of the wonderful things to see and do in the area while you’re on vacation. Located on the main level of Dreamscape is a romantic and restful king suite bedroom. 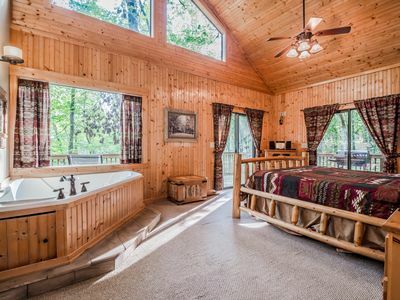 Here you’ll find a custom log crafted bed and a soothing indoor heart shaped jetted tub. 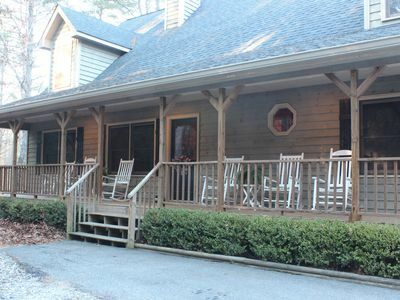 You have two sliding glass doors with one leading out to the Covered Deck, and one leading out to the Open Air Deck. You have a Satelllite TV., a Stereo, & Ceiling Fan in your suite. You have a Full Bathroom. 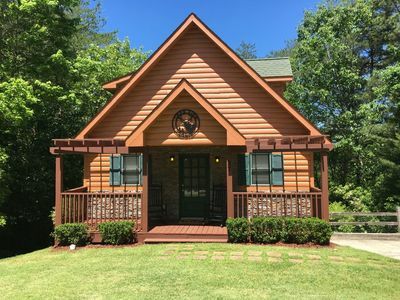 You will find a Gas Grill & Dining, Table for 4, and lovely deck furniture right outside your glass doors to take in the Senses and Sights of the Forest. With a candle burning & steaks on the grill what more could you ask for? There's always more! You have a Full Kitchen including a Ninja Coffee Bar with Frother, a Stove/Oven, Microwave, Refrigerator,, Dishwasher, Toaster, Blender, Dishes/Pots/Pans, Silver & Glasses. There is another glass door leading from the kitchen to the deck with the grill and outdoor dining table. The Open Floor Plan with the Living Room/Dining Area Combination has a Sofa, Reclining Chair, Ottaman, Coffee Table, TV, Stereo, Fireplace, Ceiling Fan and Dining Area for 4. Downstairs: Enter your Queen Size Bedroom with a Full Bath. This room Sports a Full Size Pool Table, Dining Table, Mini-fridge, & Coffee Pot. 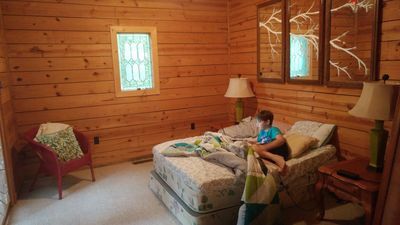 You have a Ceiling Fan, and a TV & Stereo at the foot of your Bed. 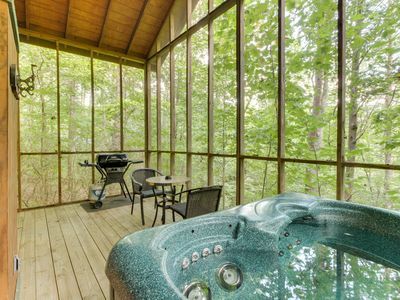 There is a Sliding Glass Door leading you out to the Deck with a Hot Tub, Outdoor Dining Table for Two, and a Small Charcoal Grill. 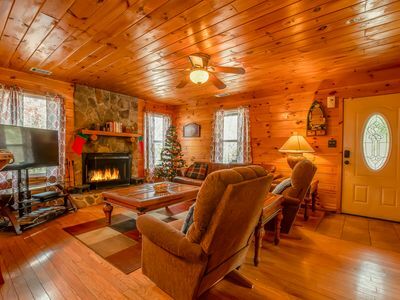 On the front side of your cabin is a Porch, and where you will experience the Fire Pit, Surrounding Chairs, & Forest.. You will find Marshmallows Roasting Sticks hanging on the deck wall next to the kitchen door. 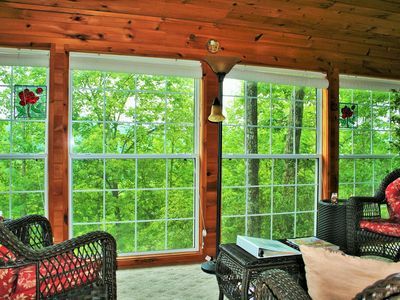 With windows galore you will enjoy beautiful patterns of sunlight beaming throughout the entire cabin as you also take in the forest window views. The Decks all have individual lighting. You can light up one deck or you can light up them all. 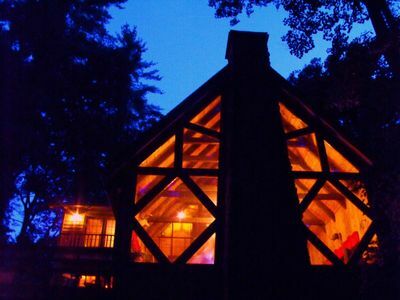 At night you will see the Star Shower Lighting behind the cabin, and watch the forest dance and delight in colors. 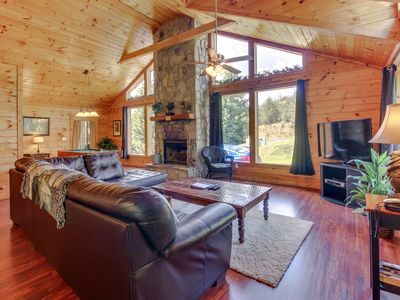 With Three TV's everyone will be content when it comes time for your viewing pleasure. The living room TV also has Netflix. 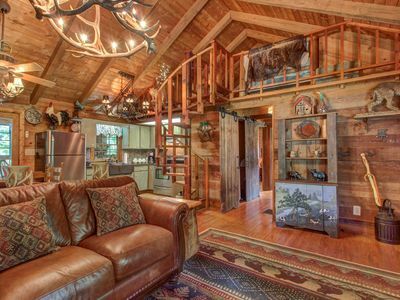 Experience the indoors, and experience the outdoors in your own secluded universe. 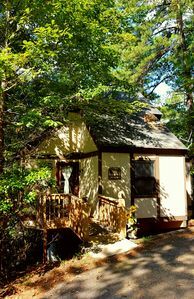 In this romantic setting you won't see any people or cars at this cabin, but you will see nature at it's most pure while you rest and renew yourself. There is lots of fun to be had here. 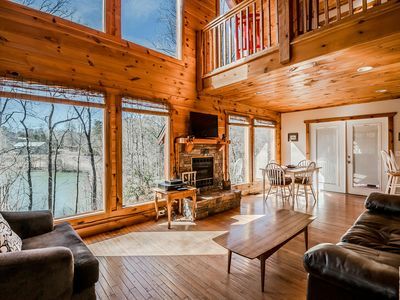 This cabin experience is a fun-filled vacation experience all of its own. 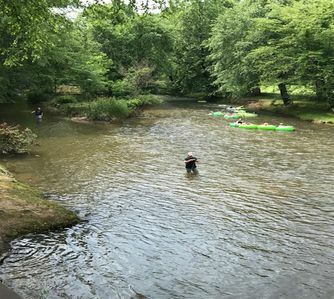 When you add the fabulous fun from the City of Helen, and its surrounding outdoor mountain activities you have it all!!! Pets are welcome: max 2 medium dogs. Maximum of 4 adults, children are welcome. Mt. 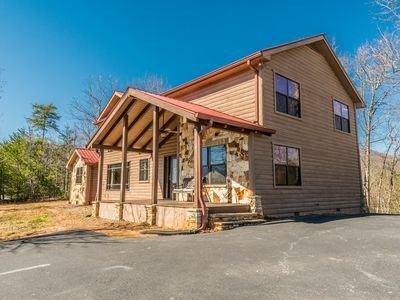 View, Custom Built Real Log Cabin near Helen GA! 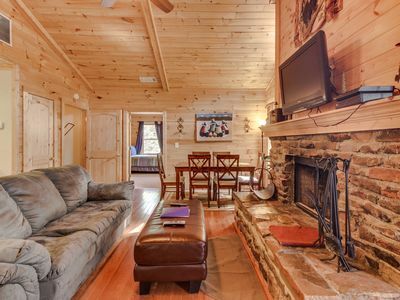 Dog-friendly log cabin w/hot tub, screened-in deck & heart-shaped jetted tub! Luxury cabin 10 minutes to Helen! 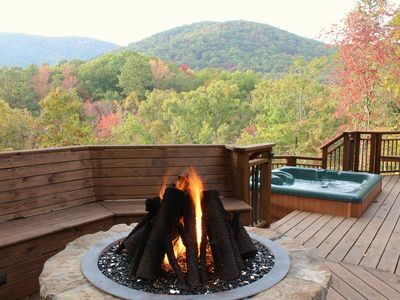 Hot Tub, Sauna, Fireplaces!! ALL PAVED ACCESS! 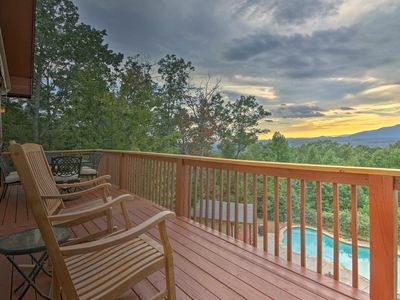 Redesigned Cabin w/ Pvt Pool - 6 miles to Helen!